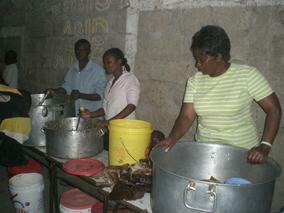 Salome, the Director of By Grace, passing out food to the children. By Grace feeds and cares for approximately 250 orphaned and vulnerable children on a full time basis. Over the last few years, the price of staple food products has been steadily increasing. Kenya has suffered persistent drought and is currently experiencing record high costs on maize and maize products. An average meal at By Grace consists of a mixture of maize and beans, rice, or ugali (a staple Kenyan food made from maize flour cooked with water). When funds allow, the children receive two meals a day with tea and bread or porridge served for breakfast. Fruits, vegetables and milk are added to the meals whenever possible; however, funds are rarely available for these items and the children do not receive them on any regular basis. When we visit By Grace, we often work with other volunteers to sponsor celebration dinners where the children enjoy a very rare meal of meat and vegetable stew, chipate (Kenyan flatbread), fruit, and milk or soda. On these nights the children often boast how they are “eating like Kings”… Itemized below are the minimum costs for one week of food supplies, clean water for cooking and drinking, and soap for bathing, dishes, and laundry. Note that the above does not include breakfast food supplies such as tea, bread, and porridge, nor does it include cost for, fruits, milk, or meat as the Centre rarely has funds to allow the purchase of these items. The MONTHLY need for minimum food supplies, clean water, and soap equals $5004.00. With your help we can help provide the children at By Grace with daily meals, clean water for drinking and cooking, and soap for cleaning and bathing. With a monthly donation of just $30.00, you can provide one child with food, soap, and clean water for the entire month. That is less than a dollar a day. All these children need is for people like you to stand up with us and give them an opportunity to grow so that they can one day share their gifts with the world.